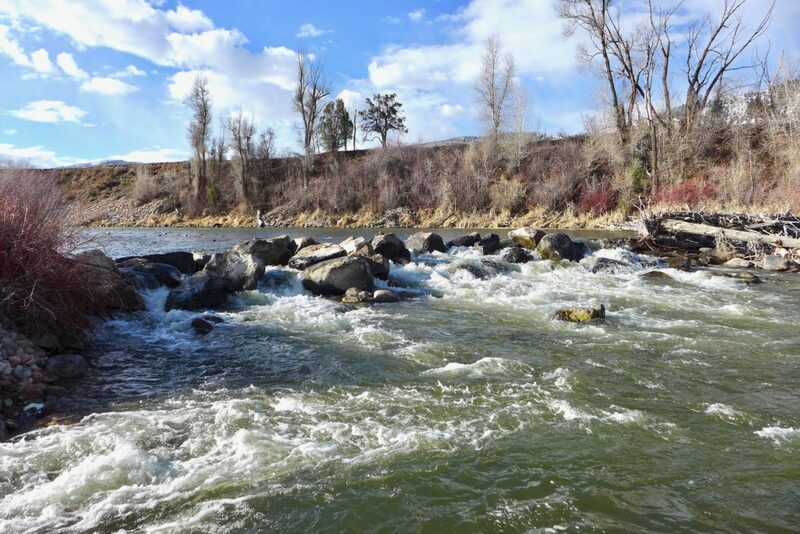 The Robinson Ditch diversion structure on April 6, 2019, when the Roaring Fork River was flowing at a low 250 cfs. BASALT – Boaters beware: The big rock weir across the Roaring Fork River near Basalt that helps funnel water to the Robinson Ditch is more dicey than it used to be. The 140-foot line of rocks, at Willits Lane, is just upstream of the Aspen Basalt Mobile Home Park. The weir is called “Anderson Falls” by raft guides at Blazing Paddles and the “Robinson Diversion” by guides at Taylor Creek Fly Shop. There was never really a clean or easy passage through the rocks — which create a 31/2 foot drop — before the ice flows, or Monday’s repair job. At low water, Blazing Paddles’ raft guides often ask a guide to stand on the weir and direct guests in inflatable kayaks, or duckies, to the least gnarly spot to get through. Many fishing guides will ask guests to get out and walk around the diversion. But now it is even less clear where a dory, a raft, a duckie or even a standup paddleboarder can get through, although river-right still might be the best bet. Looking downstream at the rock weir that stretches across the Roaring Fork River on Tuesday, March 26, 2019. Called ‘Anderson Falls’ by some raft guides, the river drops three-and-half-feet on the other side of the rocks, into a pool littered with small rocks and debris. A map showing the location of the Robinson Ditch diversion, where Two Rivers Road and Willits Lane intersect with HWY 82, downstream from old town Basalt. In the past, there was something of a sneak on river-right at low water, and at high water, some boaters would use the channel on river-right that directs water to the headgate of the Robinson Ditch. But a close inspection Tuesday did not reveal an obvious route to paddle through. “There really isn’t a way to get through it,” said Bill Reynolds on Tuesday, when asked if the repair job created an easier boating route. Reynolds is the director of the Robinson Ditch Co. and the Mid Valley Metropolitan District, a large shareholder in the company. He said when an ice dam broke in January on the Fork and flowed downstream, “it blasted a big hole right through the middle” of the weir. That might have been welcome news to boaters, but the ditch company went into the river Monday to claw the boulders back into a position so that the weir could function as intended. A view of the headgate on the Robinson Ditch and the boulder structure in the Roaring Fork River that maintains the grade of the river so water can reach the headgate. The water that reaches the headgate does not come directly off of the diversion structure, but enters a channel just upstream. The weir maintains the grade, or level, of the river in that section, which in turn allows water to flow into the upstream channel on river-right and directs water to the headgate. The ditch first started diverting water in 1882 and now has water rights for 20 cubic feet per second dating to the 1880s and another right for 20 cfs with a 1900 appropriation date and a 1936 adjudication date. The ditch usually diverts about 40 cfs, Reynolds said, and sends irrigation water to Willits, Crown Mountain Park, the Tree Farm properties, the Crawford properties in El Jebel, and the Blue Lake, Dakota and Cerise Ranch subdivisions. Reynolds said he’s now waiting to see what this year’s high water does in terms of rearranging the rocks before making decisions about additional work in the river. 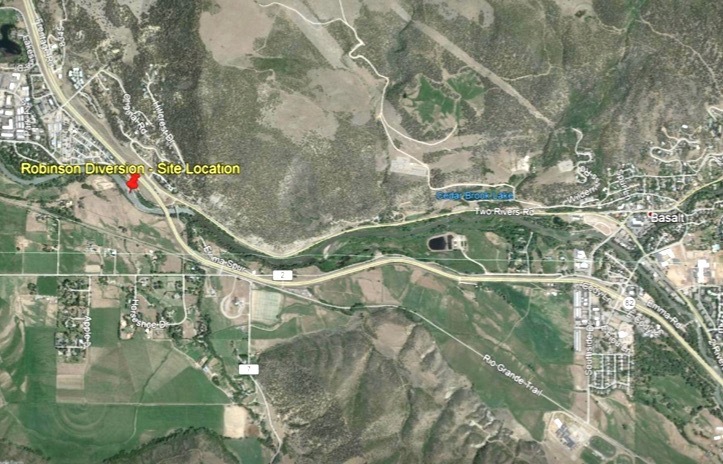 Images from a plan submitted by Pitkin County to the CWCB seeking a $45,000 grant to fix the Robinson Ditch diversions. Ironically, there was already an ongoing effort underway to raise funds and gain approvals to rework both the rock weir and the Robinson Ditch headgate. Toward that end, the Colorado Water Conservation Board approved a $45,000 grant last week. 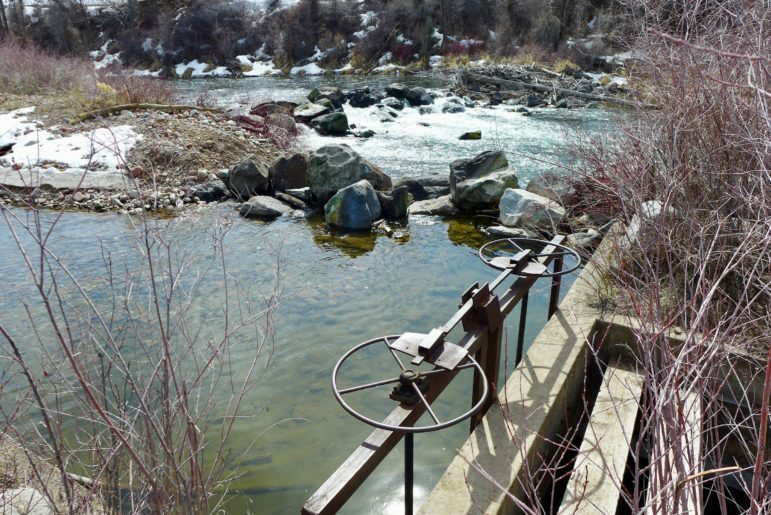 Pitkin County’s Health Rivers and Streams Board was the official applicant for the state grant, and the county is seeking to put together $800,000 to fix the diversion structure and create a boat chute in the river. 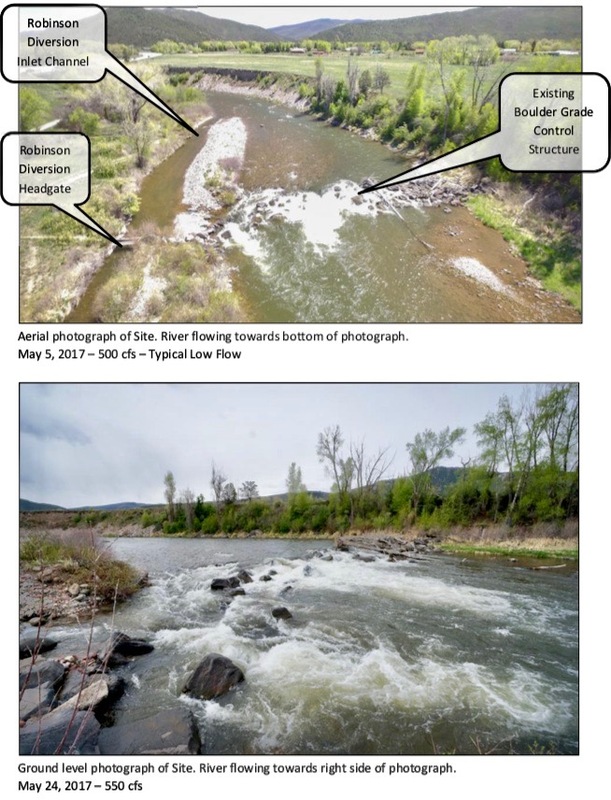 “At all water levels, and especially lower levels, the area has been a real danger for our float guides and other recreational users,” states a 2018 letter to Pitkin County from the Roaring Fork Fishing Guide Alliance. A rendering, from River Restoration in Carbondale, of how ‘Anderson Falls’ might look in the future after current plans are implemented. 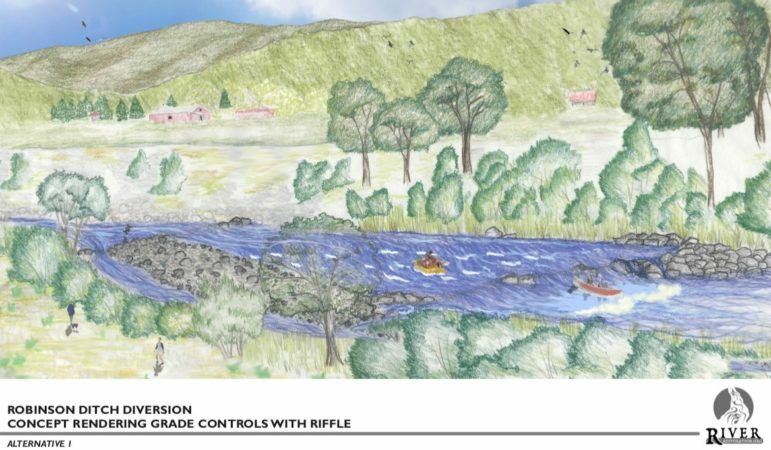 A second weir would be added upstream, which allows the downstream weir to be lowered, and routes for boats can be built into both structures. A conceptual design of the re-worked diversion structure at the Robinson Ditch. 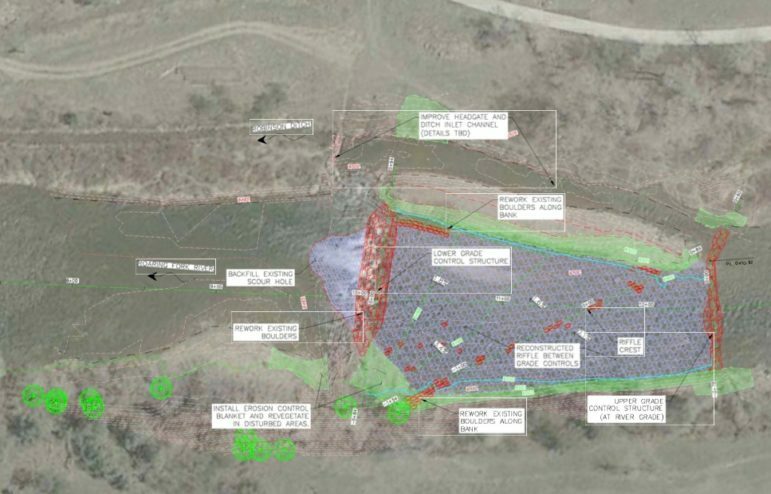 The proposed project would rebuild the current weir at a lower height, and add a smaller one upstream to manage the grade in the river, according to Quinn Donnelly of River Restoration in Carbondale. He is the consultant to the county on the project. A prime objective of the project is to improve boat passage through the area, while also improving the headgate on the irrigation ditch. In addition to the state’s $45,000, which came through the Colorado River Basin Roundtable, Pitkin County has agreed to put in $110,000. 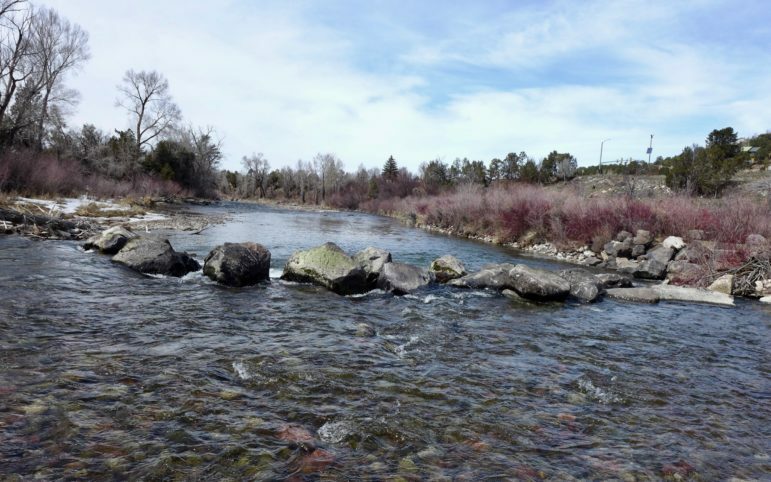 The county also has applied for $80,000 from the Fishing Is Fun program at Colorado Parks and Wildlife, and is seeking $25,000 from Eagle County and $171,000 from the CWCB’s state water-plan grant program. That leaves $369,000 of the $800,000 yet to be raised by the county to fix Anderson Falls. The Robinson Ditch Co. and the Mid Valley Metro District are supportive of the project, Reynolds said, but have yet to commit to helping fund the project. Donnelly said if the balance of the funding for the project is obtained this year, the work could take place as soon as this fall, but that is not expected at this time. Aspen Journalism covers rivers and water in collaboration with The Aspen Times, the Glenwood Springs Post Independent, the Vail Daily, the Summit Daily and the Steamboat Pilot. The Times and the Post Independent published this story on March 27, 2019.